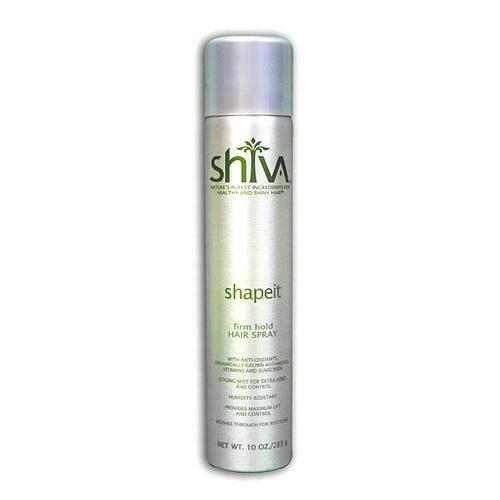 Shane Shirley : Turn Your Hair "Green" - Win Shiva ShapeIt Eco-friendly, Organic Hairspray! Turn Your Hair "Green" - Win Shiva ShapeIt Eco-friendly, Organic Hairspray! Hi all! I must apologize for not posting more frequently lately but I have been totally bogged down with being a mommy...and thoroughly enjoying it. The end of school for each of my three girls means plays, performances and a mega dose of volunteering. My take on living green is that it not only means making Eco-conscious consumer choices, it also means doing all we can to "treasure self, people and planet". I recently realized that I have devoted a ton of time to getting the green living message out to others over the past couple of years, but I in doing so I have not been fully treasuring those around me. My girls are growing up so fast and I want (and need) to share as much as I can with them while they are young. Each day I realize what wonderful creations my children truly are. So as the summer begins and the kids are around every day, I will probably be posting less often so I can devote more time to my family. Anyway...let's talk "green" hair and win some Shiva ShapeIt Eco-friendly hairspray! This is a super easy Eco-contest that simply requires leaving a comment at the Chic Galleria on line magazine. I, myself, have never used Shiva ShapeIt but I must say that I left a comment as I would love, love, love to win this. This Shiva Eco-spray is supposed to have super hold and lift (wish they were talking body lift here) and contains organically grown botanical ingredients which are bottled in recyclable single layer packaging. It has a retail value of $15.98 and is never tested on animals. I love that this is organic and you can recycle the canister!! The contest ends May 16, 2010 so get your Environmental Booty over to the Chic Galleria and turn your hair "green". Click HERE to join our green living, online community!